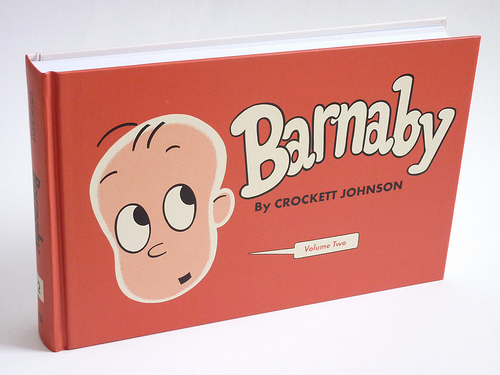 You don’t need to get all of Crockett Johnson’s allusions to enjoy his classic strip, Barnaby. But I’m the sort of person who wants to know these things. So, at the back of each Barnaby book (5 volumes, Fantagraphics, 2013-2017), I’m providing notes for other readers like me. You know who you are. But Crockett Johnson was smarter and more widely read than I am. So, even though I’m his biographer, I occasionally miss things. For Barnaby Volume Two: 1944-1945 (just out this month), two readers have already written in with corrections. (Two! Already!) Here are the strips in question, my original note, and the correction. SWAMI ESYAYOUISIJA (26 Sept.). The Swami’s surname spells “YES” in four languages: Pig Latin (ESYAY), French (OUI), Spanish (SÍ), and German (JA). That’s correct. But as Mr. Russell (@belmontlibrary on Twitter) pointed out, Johnson has also embedded the word OUIJA here. I expect that Johnson first noticed that “oujia” included the words for “yes” in both French and German, and then decided to create the swami’s name by adding “yes” in two additional languages. Very clever! Sigahstaw (27 Oct.). Purely imaginary tribe. It is, however, an anagram for A Sightsaw (which itself is the past tense of Sightsee). Perhaps a reference to Indian reservations as tourist sites? In my opinion, “Sigahstaw” should be the pronunciation of “Cigar Store”, so that a “Sigahstaw Indian” is actually a “Cigar Store Indian”, like the ones in wood staying in front of cigar stores (well, I have seen them only in comics, I do not live in US). In fact, in the same strip, Howard the Sigahstaw Indian has cigars in his hands, like a cigar store Indian (see second and third panel)! Mr. Polesello is quite right. As Eric noted, “This is one of those moments where you just tap palm to forehead and think, ‘Of course! How could I not see that?! ?’ Ha!” Exactly. Can’t believe I missed that! And yet I did. Should we get to do a second printing of Barnaby Volume Two, we’ll fix the notes. Meanwhile, I will just repeat that Johnson was cleverer than I am. I’ll strive to do better on the notes for Barnaby Volume Three: 1946-1947 (due out in 2015). Finally, thanks to those who are buying the book, and even (gasp!) reading my extensive notes! Copyright © 2014 Nine Kinds of Pie. Powered by WordPress and A Dream to Host theme by Art of Blog.